So, I was at my office today and I was calling people to encourage them, pray for them and to invite them back to church. I’ve noticed something about people in my years as a pastor. Sometimes, people just sort of disappear from church. They just fade away and stop attending Sunday morning services and Bible studies during the week. Well, in my many telephone and face-to-face conversations with people, I’ve discovered the phenomenon that I believe causes this on-and-off commitment to attendance at their local church. Well, that’s a lie everybody. As a matter of fact, church, in the middle of the family of God, is exactly where you need to be when you’ve given in to temptation and committed some horrible sin. Because that’s where you’ll encounter a group of people who are imperfect (just like you) and are ready and willing to pray for you, encourage you and help you back onto the path you’re supposed to be on. Think of it this way. Imagine a camp fire. There’s a nice bed of coals at the bottom of this raging camp fire. Imagine you take a stick and you scoot one of those big glowing coals out from its hiding place in the fire and you move it away from the fire into the middle of a dirt patch. There it sits, smoldering away. What will happen to that coal if you leave just sitting there in the dirt? Right! It will eventually smolder out and die. You see, that’s what happens to you and me when we separate ourselves from the family of God. 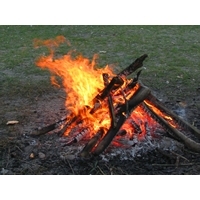 In that illustration, the blazing camp fire is the family of God. That’s right where each of us should be. Even when we’ve sinned. We need to run back to the blazing fire of the presence of God that can only be found in the midst of the family of God where we can receive just what God wants us to receive. Hey, it’s time to get back to church. Don’t let satan lie to you and convince you that you’re too filthy or covered with shame to come back into the blazing fire of God’s presence within the family of God. That’s a lie from satan and you need to see it as such. God wants you to participate in the family and to be a part of it. As a matter of fact, the body of Christ, the family of God, isn’t complete without you there (just look at 1 Corinthians 12). It’s time to get back to church brother or sister. We miss you.